The apple has captured our imagination like no other fruit. From Adam and Eve to Newton and his arrow, apples have figured prominently in the storytelling and lore of almost every culture. Do you have an apple for the teacher? Are you as American as apple pie? Do you compare apples and oranges? An apple a day keeps the doctor away. If you want apples, you have to shake the trees. Apples have a core, and so does every person. Is someone the apple of your eye? 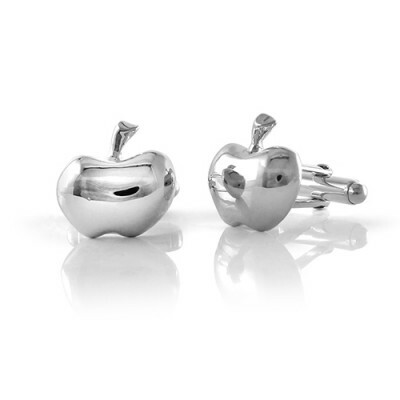 If so, these handmade sterling silver apple cufflinks will make the perfect gift. One rotten apple may spoil the bunch, but our handmade sterling silver apples will never go bad.